Alexander Komelkov wins prestigious Coupe Mondiale Competition in Finland. A 19-year-old Russian accordionist has won the world's top competition for players of the instrument. 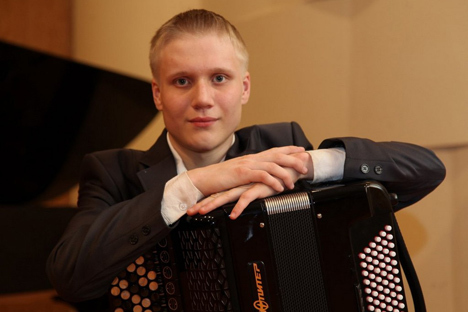 Alexander Komelkov, from the city of Vologda (250 miles north of Moscow) won the Coupe Mondiale Competition, an international accordionist contest in Turku, Finland, in the Masters category (for performers under 35 years old). Komelkov is a fourth-year student of the Volgograd Regional College of Arts. According to the press service of the Vologda region's administration, the duo of Komelkov and college teacher Mikhail Naumov took second place in one of the ensemble categories. The Coupe Mondiale Competition is the world's most prestigious competition for accordionists. This year, it featured 90 musicians from 25 countries.